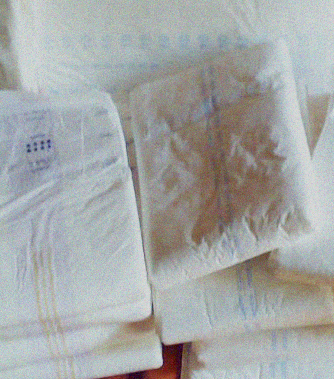 What are the critical supplies to have on hand for a diaper lover or adult baby? You may not be able to have (or necessarily want) a full nursery, but it seems to me that at the very least you should have a well-stocked changing area for your little one. Leaving aside clothes, furniture and toys, I’m a big believer that having an area of the house with your son’s diaper supplies helps to create a safe, trusting space for changes and provides a visible reminder that the AB/DL in your life is living his life snug and secure in diapers. When your son walks into the room with his diaper supplies plainly visible, he’ll feel assurance and safety – he’s able to be the little one he’s always wanted to be, and will remember that daddy will keep him pampered and take care of him. Now, diapers are of course the number one thing. I prefer to have more than one kind. Little boys will have different needs that might even depend on the time of day or what daddy has planned. Thicker diapers with stuffers for night (Bambinos makes a great diaper with great inserts), various brands of adult and youth diapers, Goodnites, and a supply of super thick cloth diapers and plastic pants are essential. A few packages of Pampers or Huggies beside the stack of diapers might never get used because of their size, but they make great inserts and the packaging is a great way to evoke babyish feelings. Other supplies include the obvious: baby wipes (Huggies makes a brand that smells particularly babyish), powder (again, scent is everything! ), rash cream, vaseline, and baby lotion are all important supplies. Ideally, you’d have some toys, rattles and pacifiers nearby as well, to distract your ‘son’ during change time. If you can have a big stack of onesies in different colors in a visible place, this is both handy and a great reminder that his onesies will help him stay snug and secure. But for you diaper lovers and baby boys out there – what do you like to see when you look at the diaper supplies? What are the essential things that daddy should have on hand? And do you like to see big stacks of diapers out or just a few? WHERE CAN I GET BAMBINOS? I WANNA TRY COUPLE BIANCO? Definately lots of diapers are needed the bigger the stacks, the better. Having a variety of different kinds is key to keeping being diapered fun. The kind of diaper I put on is a sign of my mood and I like different colored diapers not just white ones. I have Purple, Blue, Green, and a few with prints like ABU or Bambino which I tend to save for a special treat. When getting changed I love to cuddle my Plushies… Always make sure to have lots of plushies from small to BIG in the Nursery. I love the smell of baby powder and baby oil. I love to use Bambino diapers. Want to also try Abenas. I currently have a closet to keep all of my stuff organized. I’ve got 3 different types of abenas, some attends, and bambinos classicos. Also I have 4 onesies a couple sleepers and lots of cloth diaper covers and all in one pull ons. I dont have any real cloth diapers though. My daddy keeps a good girl jar of pacis and a jar of bad girl pacis (they are pacis filled with viniger) he keeps bottles an multiple types of diapers and wipes and powders. Had horrible rash again and my usual stuff stopped working. So I decided to try Desitin for the evening (after dinner) diaper and then put some baby powder on top of that. Then I did it for the bed time diaper and it really seemed to help. Tried to find a site we have for diaper rash cures but did not find one – but I thought there was another one we had posted some time ago.